Herbs, perennial (annual-), cespitose. Culms trigonous or ± terete, (3-)20-45(-70) cm × (0.8-) 1.2-2 mm, glabrous. Leaves (2-) 6-10(-16), flat to V-shaped, (2-) 10-30(-60) cm × 1-4 mm. 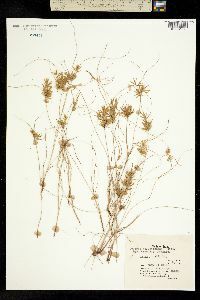 Inflorescences: spike 1, loosely ovoid to densely turbinate, 12-40 × 10-25 mm; rachis 3-10 mm; rays 1-8(-12), 0.5-3(-6) cm; 2d order rays absent; if rays absent, inflorescence single dense cluster of spikelets, 12-40 mm diam. ; bracts (3-)4-6(-7), horizontal to ascending at 45°, flanged V-shaped, (2-)5-15(-23) cm × 1-4 mm. Spikelets (5-)15-30(-40), spreading to appressed-ascending, linear-lanceoloid to linear, compressed, 8-18(-40) × (1-)1.3-1.6(-2) mm; floral scales (8-)12-25(-66), laterally stramineous to light brown, medially green, laterally ribless, medially 3-5-ribbed, oblong, (1.5-)1.8-2.4 × (1-)1.2-1.4 mm, apex acute to ± acute, mucronate. Flowers: stamens 2; anthers (0.4-)0.5-0.8 mm, connective not prolonged; styles 0.6-1(-1.4) mm; stigmas (1-)1.4-2 mm. Achenes light to dark brown, oblong, (0.8-)0.9-1.1(-1.2) × 0.4-0.5(-0.6) mm, base cuneate to ± stipelike, apex truncate, apiculate, surfaces punctate to minutely punctate with raised cells. Fruiting summer-early fall. Shores, ditches, swales between dunes; 0-200 m; Ala., Del., D.C., Fla., Ga., Ky., La., Maine, Md., Mass., Miss., N.J., N.Y., N.C., Okla., Pa., S.C., Tex., Va., W.Va.; Mexico; Central America; South America; Asia; Africa. 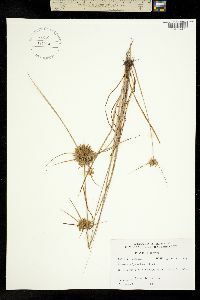 Cyperus polystachyos is polymorphic. Adequate understanding of the infraspecific variations of C. polystachyos requires a worldwide examination, which is beyond the scope of this study. The segregates, C. fugax and C. filicinus, are recognized here; they have been usually accepted by recent workers (e.g., M. L. Fernald 1950; H. A. Gleason and A. Cronquist 1991).